In the second article in the series about mycorrhizal fungi in farmed soil, soil microbiologist Dr Michael Amaranthus and colleagues explore the why’s and where fore’s of how these fungi can improve crop yields, reduce low growing season rainfall risks and lower overall production costs. Mycorrhizae’s ubiquitous presence throughout soil surrounding crop roots can access relatively scarce nutrient resources, and in many cases, release them from insoluble compounds via the production of specialized enzymes. Let’s begin with a topic that interests all farmers and one to which nearly all the other benefits of mycorrhizae are inherently linked- improving crop yields. Typically, mycorrhizae’s single most prominent contribution to a crop plant is improved access to and uptake of phosphorus (P). All farmers are intensely familiar with the importance of this elemental nutrient to essential plant functions which include energy transfer, photosynthesis, transformation of carbohydrates, systemic nutrient mobilization and genetic transfers. Given that often one of the most noticeable evidences of P deficiency in a crop is reduced yield (or in the case of forage, reduced quality,) it is no wonder that P is such a critical (and expensive) component in basic crop fertilizers. Much of the naturally-occurring P in soils is found bound tightly with elements such as iron or aluminum in the form of recalcitrant compounds. Similarly, P inputs derived from fertilizers often react with ambient soil cations to form insoluble salts. In natural ecosystems, plant communities rely on mycorrhizal fungi to access these forms of phosphorus. Mycorrhizal hyphae produce enzymes, including phosphatase to convert phosphorus into soluble, plant-usable forms. This same process can be valuable in agriculture, maximizing the availability of natural soil P as well as dramatically enhancing the efficient uptake of P derived from fertilizers. With greater P uptake, cost go down and yields frequently increase as well. The availability of nitrogen can also be factor in limiting crop productivity for reasons opposite of those limiting P. Available nitrogen in the forms of nitrates (N03), nitrites (N02) and ammonium (NH4) are very soluble and can flow past the root zone before roots can absorb it. This means they are often lost to runoff, groundwater or trapped in subsoil beyond the access of roots. 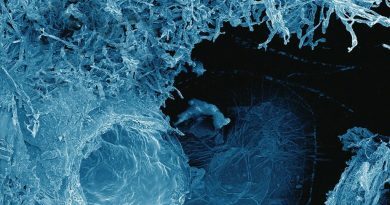 The profoundly dense network of tiny hyphae filaments in a mycorrhizal system typically extends 45 to 60 centimeters beyond the roots themselves, increasing the absorptive surface area of colonized roots hundreds to thousands of times. A teaspoon of mycorrhizal soil can easily contain several kilometers of hyphae, all of which is highly absorptive of soluble nitrogen ions, ensuring optimum uptake and the associated nitrogen-related cropping benefits. Another source of nitrogen uptake unique to the mycorrhizal symbiosis has recently been discovered by scientists at University of California, Irvine, USA. The researchers set out to explore how nutrients, including nitrogen, are mobilized through the environment. Using cutting-edge technology, nanometer-sized bits of semiconducting material called “quantum dots” were attached to organic compounds such as nitrogen-laden amino acids. When energized by an ultraviolet laser, the tiny “dots” emit light, becoming detectable by special cameras positioned in the root zone of plants. In this manner, they could track nutrients as they were absorbed into the microscopic mycorrhizal hyphae and follow their subsequent movement into the tissue of the host plant. For well over 100 years conventional scientific wisdom has held that root absorption of nitrogen is restricted to inorganic forms of nitrogen such as described above- N03, N02, and NH4. But to their surprise, the scientists saw the illuminated “dots” attached to amino acids enter the mycorrhizal hyphae and observed them as entire molecules moved into the root cell vacuoles and then continued systemically to the chloroplasts where the nitrogen is used for photosynthesis. In non-mycorrhizal rhizospheres, amino acids, which are the primary components of proteins, must undergo extensive and time-consuming decomposition processes by bacteria and other soil organisms before nitrogen is released in inorganic, plant-usable forms. In many cases, much of the nitrogen is consumed by the organisms, further delaying its plant availability. This research demonstrates that mycorrhizal fungi allow their plant hosts to bypass this process, implementing quick and effective access to organic nitrogen sources. What this means to the farmer is that by utilizing mycorrhizal fungi, naturally-occurring and introduced sources of organic nitrogen such as found in fish-based fertilizers, green manures, and compost can provide a readily available source of nitrogen to promote crop growth and enhance yields. In addition to phosphorus and nitrogen, the mass of hyphal filaments in the soil surrounding mycorrhizae-colonized roots is also capable of mobilizing an array of other important plant nutrients including calcium, iron, magnesium and critical micronutrients such as manganese, zinc and copper. Just as a lack of vitamins can impair human or animal health, crop yields and forage production are sometimes limited by insufficient supplies of these minor and micro nutrients, even when N-P-K is abundant. Mycorrhizae’s ubiquitous presence throughout the surrounding soil can access these relatively scarce resources, and in many cases, can release them from insoluble compounds via the production of specialized enzymes. The management of micro-nutrients is becoming increasingly recognized as an important component of modern cropping science. Mycorrhizal fungi can serve as useful tool to ensure that both natural and introduced sources of these nutrients are transferred efficiently from the soil to the plant. Mycorrhizae’s significant assistance with nutrient uptake is important, but it is not the only crop-enhancing benefit offered by these amazing fungi. Another valuable feature is water management. The expanded and enormous absorptive surface area connected to the roots is going to ensure that nearly all moisture in a plant’s surrounding soil is accessed. But what then? Once the soil is dry, how can the plant survive? Mycorrhizae provide a mechanism inside the root cells that addresses this problem. When a root cell becomes colonized by a mycorrhizal fungus, a special shared organ called a vesicle grows inside the root cell. The vesicle is essentially a storage container for water and dissolved nutrients that can be utilized in times of deficiencies, such as drought periods. When moisture and nutrients are abundant in the soil, surplus supplies are stored in the vesicle. When moisture and / or nutrient shortages occur, the plant begins to utilize the resources stored in the vesicles to avoid stress for extended periods- often weeks or even months longer than non-mycorrhizal plants. When moisture or nutrients again become available, the plant is able to return to normal, healthy respiration and growth without shock or other negative symptoms. Of course, the reservoir provided by the vesicle cannot last indefinitely, and the plant will suffer stress and ultimately death if sufficient moisture or nutrients remain unavailable for too long. However, in most cases, the extra non-stressed time provided via the vesicle allows the plant to survive until the next rainfall. This is great news for the dry land farmer. Australia’s recent excessive rainfall notwithstanding, drought is a serious risk encountered by all dry land farmers. Although not infallible, mycorrhiza inoculation offers inexpensive crop insurance as one of its many benefits. Root disease is an ongoing battle in any cropping system. Even seemingly healthy and thriving plants are enduring some levels of root disease and expending valuable energy to suppress them. When the disease gets out of control, the results can be disastrous. Mycorrhizal fungi are Nature’s principal immune system against fungal root diseases. 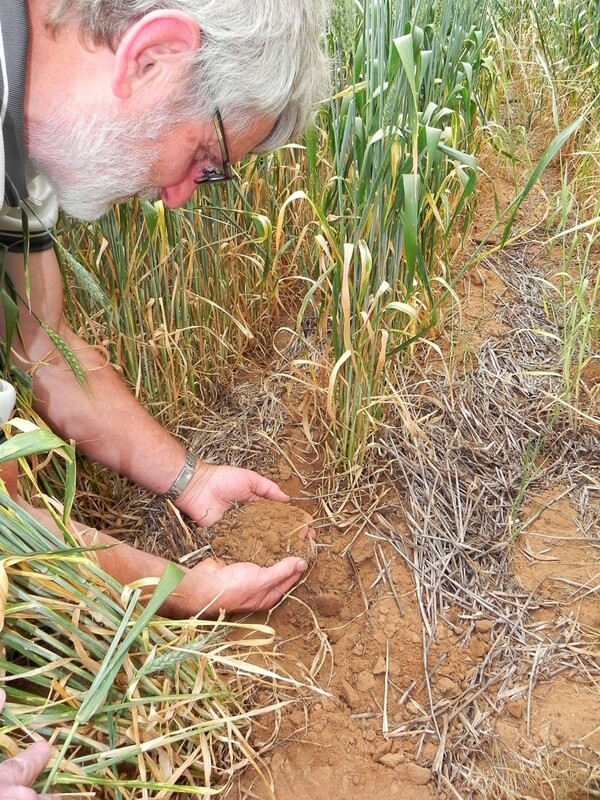 The lack of these fungi in crops and paddocks is often at the core of root disease problems. Once a plant is colonized with mycorrhizal fungi, the hyphal filaments begin to release bio-chemicals into the surrounding soil that suppress, repel and even kill fungal root pathogens such as phytopthora, pythium, rhizoctonia, fusarium, verticillium wilt and others. Specialized fungal cells begin to lay down on the outside of root cells, surrounding them with a tough chiton “armor” to protect against penetration by disease organisms. Furthermore, research shows that mycorrhizae can significantly increase the disease suppressive abilities of bacteria and other collateral soil organisms. And finally, a recent study in China confirmed that tomato plants isolated from one another in every way except their mycorrhizal hyphae connections were able to “alert” neighboring plants about impending disease. Within a few hours of one plant being infected with “early blight” disease (Alternaria solani), nearby healthy plants began producing elevated levels of disease-specific defense enzymes. 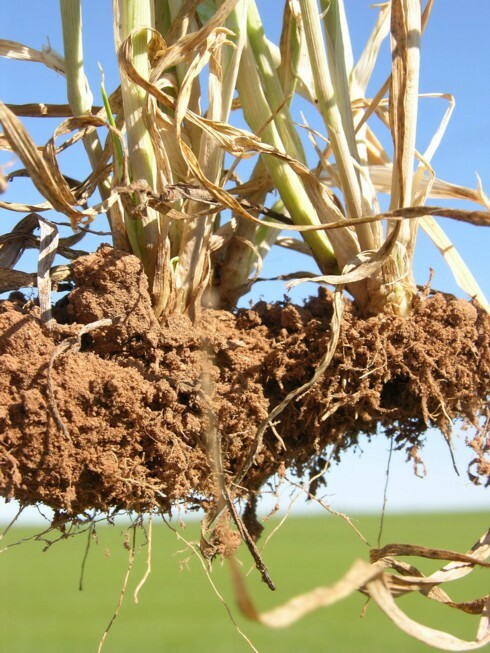 Enhanced nutrient uptake and efficiencies, drought tolerance and fungal root disease suppression are among the primary advantages mycorrhizae can contribute to a cropping or paddock management operation. By increasing yields and / or reducing costs, these fungi offer natural and powerful solutions to some of our most persistent and vexing challenges on the farm. Article 3: Harnessing the power of fungi: how to put mycorrhizae to work on your farm. Dr Michael Amaranthus is a scientific paper published soil microbiologist; co-writers are Larry Simpson, director of education and training, Mycorrhizal Applications, Inc, Grants Pass, Oregon US larry@mycorrhizae.com; www.mycorrhizae.com; and Dr Nick Malajczuk, director of MAI (Australia) Pty Ltd Bunbury WA, nick@maiaustralia.com.au . Copyright Michael Amaranthus.